This place lies in the delta of Godavari River; where the river meets its tributary Koringa River (Coringa River), 9 kilometres from the Bay of Bengal, on the Coromandel coast. Anything on this train enthuses me – as I read that Circar Express has been augmented with one AC III Tier Class Coach from 28th June 2015. This train takes more than the regular time for the 700 km that it traverses. It is scheduled to depart daily from Egmore at 17.20 hrs and reaches destination – Kakinada Port at 10.10 am the next day. Interestingly, the Kakinada Port has shifted a couple of kilometres from its earlier position in 1990s. Also on a recent visit a couple of years ago, saw a new station at Sarpavaram though Circar did not stop there. The stations from Chennai Egmore on Circar route are : Gummidipundi, Sullurupeta, Nayadupeta, Gudur Junction, Nellore, Bitragunta, Kavali, Singarayakonda, Ongole, Chinnaganjam, Vetapalem, Chirala, Bapatla, Nidubrolu, Tenali Junction, New Guntur, Mangalagiri, Vijayawada Junction, Gudivada Junction,Kaikaluru, Akividu, Bhimavaram Town, Attili, Tanuku, Nidadavolu Junction, Kovvur, Godavari, Rajahmundry, Dwarapudi, Anaparti, Samalkot Junction, Kakinada Town Junction and destinates at Kakinada Port. Most trains are named after Gods, rivers and important places in the origin or destination – but this one is a bit different - it is known as Circar Express ! The word ‘Circar’ – noun would mean a District or part of a Province. This is a common word to old timers as there was the ‘Northern Circar’ - which was a former division of British India's Madras Presidency, which consisted of a narrow slip of territory lying along the western side of the Bay of Bengal in the present-day states of Andhra Pradesh and Orissa. These Northern Circars were five in number, Chicacole (Srikakulam), Rajahmundry, Ellore (Eluru), Kondapalli and Guntur. After changing hands frequently between the Bahamani Sultans, the Mughals, the Nizams of Hyderabad and the French, the British finally took over. In 1765 Robert Clive obtained from the Mughal emperor Shah Alam a grant of the five Circars. Thus over the years the possession of these places and the geographical pattern kept changing. The Northern Circars were governed as part of Madras Presidency until India's independence in 1947, after which the presidency became India's Madras state. Circar Express runs from Madras to Kakinada. The city of Kakinada is the HQ of East Godavari Dist and is known as Fertilizer city due to the presence of big Fertilizer units of NFCL, GFCL etc., It also has names of ‘Pensioner’s paradise’ and old timers were happy in calling it ‘Second Madras’. Kakinada in fact is a planned, neat peaceful city. There are several edible oil refineries and the Port has become busy now a days. Today’s The Hindu reports that Circar Express would be extended on completion of track doubling work. With their aspiration for a direct train service between Kakinada in Andhra Pradesh and Puducherry set to become a reality, the Telugu-speaking community in Puducherry celebrating the golden jubilee celebrations of the Andhra Maha Sabha had another reason to rejoice. 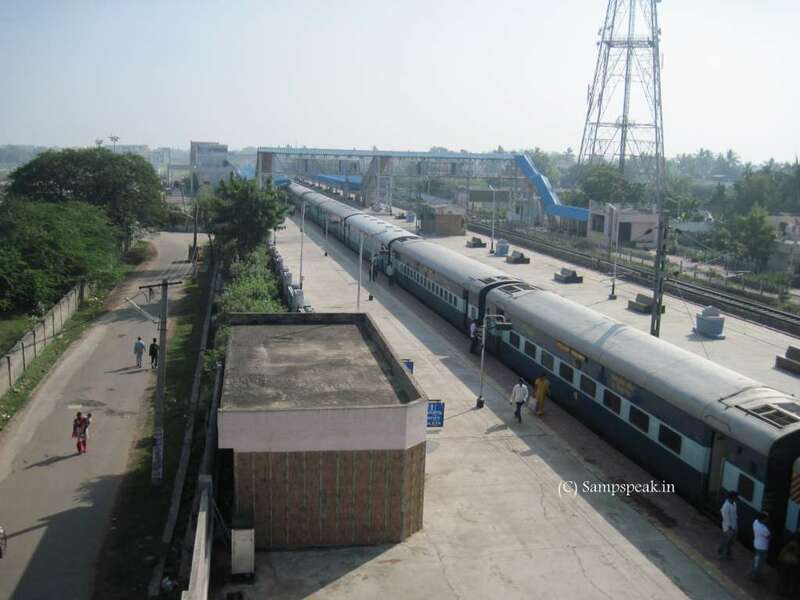 Lok Sabha Member of Parliament R. Radhakrishnan said that with the completion of the track doubling work in the Chennai to Villupuram section, the route for the Circar Express running from Egmore in Chennai to Kakinada Port Railway Station will be extended up to Puducherry. Though it would increase the time of the winding journey – there is some reason – as Puducherry has one of its districts miles away – nearer Kakinada. It is Yanam. Yanam forms a 30 km² enclave, has a population of 32,000, most of whom speak Telugu. For 200 years it was a French colony, and, though united with India in 1954, was called as French Yanam. After implementation of the Sarda Act in British India in 1929, many Andhraites went to Yanam to conduct child marriages, which remained legal under the French administration. Elections held on 24 October 1948 and 18 October 1954 are most crucial in the history of French India. In June 1948 the French and Indian Governments came to an agreement as to how the future of the French Settlements should be determined. Those days, Yanam had an extremely dominant pro-French atmosphere prevailing in its people and its leaders. But in due course of time due to nationalist struggle by some leaders, conditions became intolerable in Yanam after its mayor and other representatives of Yanam adopted the merger resolution. In 1954, there was "Yanaon A Libéré" (Yanam liberated) - coup d'état of Yanam, that had remained under French control till 13 June 1954, and joined Republic of India by Indian military action. After years of struggle the de facto transfer of the four enclaves of Pondicherry, Yanam, Mahé, and Karikal to the Indian Union was achieved. Though a treaty was signed in 1956, the de jure transfer was delayed until the end of the Algerian War. The treaty was ratified by the French parliament in May 1962. On 16 August 1962 India and France exchanged the instruments of ratification under which France ceded to India full sovereignty over the territories it held. So a day would dawn when the two distant districts Puducherry and Yanam would be connected by Circar Express.